My first electronic vinyl record ever. Bought it at Spacehall in Berlin back in April 1995. I still love to listen to it, even play it in DJ sets because the music is just pure bliss and timeless. I already had this album from when it was released but I was able to pick up this Japanese edition for a few hundred yen in a local record shop in Kashii, Fukuoka, back in 1999. Great find - especially for the VHS alone (as I had never seen these videos before). I hope Warp Records release this on DVD one day. The 2xLP version is a HOT (loud!) pressing! Worth searching for! Amazing comp which further helped cement Warp as the true leaders in this genre stupidly & pointlessly called IDM. Only low point if there is such a thing comes from ironically their biggest signing i.e. Richard, My Teapot for me doesn't sit well amongst the greatness of the other tracks. Simply the best compilation album ever, period. ASTONISHINGHLY high quality music which reads like a who's-who of classic electronica. Gushing over and onto some facts: other than the 4 tracks by B12; Speedy J; Bail and Seefeel, ALL the others here are either exclusive tracks or exclusive mixes inc those on the rare bonus 12"
This was my first CD and among all of the hundreds of compilations I bought over the years, this made a certain impression. This release from Warp has stored an era before all software synths, in a time when minimal, more is less and still soulful electronica started to become more wide spread. Simply, overall a nice Electronica compilation. In the booklet there is something pretty interesting; if you read it you can find a vision of an Internet and connected computers - just a few months before it became public 1994. That's pretty cool. [Posted 2003, edited 2019]: The last 3 tracks are exclusive to the limited edition of artificial intelligence II. 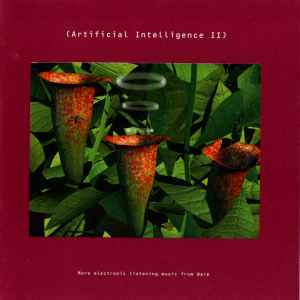 They are not released elsewhere, nor are they on the regular version of "artificial intelligence II". Furthermore another user has pointed out to me that the very last track (by Scanner) is only included on the CD format (of the LTD releases). Darrell Fitton is Bola, and this was the first Bola track I ever heard. (His first release maybe?) I remember it being exemplary of the bleepy ambient chill-out music of the time, and it remains one of my all-time favorite Bola tracks. It has a pleasantly dated '94 feel to it. Polygon Window is of course Aphex Twin. This is a weird little track, presumably made of teapot sounds (though I can't make what sort of teapot sounds they could be). It's an interesting and original piece, and not danceable at all. This release is *essential* for the Aphex or Bola collector, as well as any collector who wants to own one of the most important records in the history of "electronic listening music" or "intelligent techno" (tragically later renamed IDM–I believe by a Wire magazine article but that's just a vague recollection). If you're lucky, you can find a copy of the limited version of the 2xCD in a record store at a reasonable price because often the record store folks don't realize there's a difference between it and the standard single CD version.